Oil India Limited Duliajan Assam Recruitment 2018 September | Warden Post : – Good news Job aspirants . Oil India Limited Duliajan Assam latest Job notification is out in the month of September. Applications are invited from female candidates for engagement on contract as “Warden” in the students hostel of School of Nursing OIL India Hospital, Duliajan, Assam. 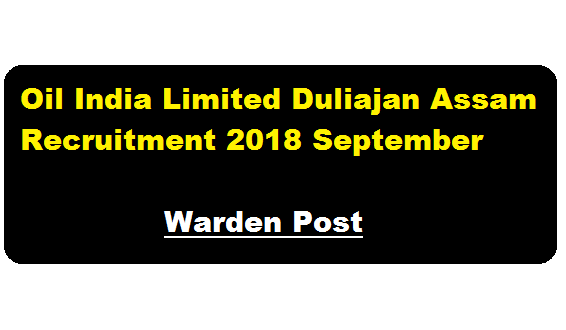 In this section, we will discuss in detail about Recruitment of warden post under Oil India Limited Duliajan latest Recruitment 2018 September with all the details and requirement. Name of the post : Warden: 01 (One) post. Educational Qualification: Any graduate preferably B.Sc. Home Science or Diploma in Housekeeping catering or equivalent. Age Limit : 40 to 50 years with sound health. Experience : Past experience of warden in college will be given preference. Salary : The above engagement as warden is purely on contract for one year with a consolidated remuneration of 12,000 Rupees per month. A walk-in interview will be held at Oil India Hospital Duliajan on 24th September, 2018 (Registration 7 am to 9 am). Candidates needs to bring all the original testimonials for document verification. The decision of management of Oil India Limited will be final in this regard.